In 2014, food historian and professor Ken Albala found himself stuck in a kitchen with no utensils. He headed for an Asian grocery store and bought a little saucepan and some noodles, to make something for breakfast. Thus started almost three years of home-made noodle soup for breakfast, practically every day. Out of that came some spectacular successes, some abysmal failures and a book. Of course, I had to put pulled noodles to the test. Ken says to use a high-gluten flour. I checked scads of sources online, and many of them say the exact opposite. Some insist that in your kneading you have to go beyond building up a strong gluten net and actually break that network down. But none of them suggest allowing the dough six hours of rest and relaxation, as Ken does. Ken’s method, at least in his video, is a little too vague to follow exactly, as he insisted I must. When to start kneading? How often to dip your hands in water while kneading? Nevertheless, I did the best I could and was somewhat amazed that it worked. It really did. And the noodles were delicious. Being the kind of person I am, I made some measurements too: 275 gm of flour weighed 395 gm when I started to knead, for a hydration of 44%. That’s stiff. And it weighed more or less the same after kneading, but maybe the water added equalled the starch removed. I do wonder whether you would reach the same end point by adding the water all in one go at the outset. The book – Noodle Soup: Recipes, Techniques, Obsession – is available for pre-order from Amazon. In the meantime, you can always search Ken’s website for “noodles”. Pocket soup, which Wikipedia calls Portable soup, was an early convenience food. I was surprised to find a recipe for a modern version. I haven’t tried it, but I do like instant miso soup. Cover picture is of Ken’s Hand Made Hybrid Noodles for Newbies. Banner picture is a video grab of me, amazed that I pulled a noodle. And those Lucky Peach links? Here you go. 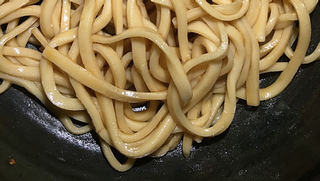 Homemade Ramen Noodles, but beware: as I discovered while hunting, there’s an error: “Apologies to Harold McGee and to all of you who tried to make alkaline noodles with 4 tablespoons of baked soda. Please only use 4 teaspoons. Damnit.” SI units FTW, dahling. The Internet Archive is a truly valuable and important resource. I donate to it. If ever you find yourself in need of a copy of something online that has vanished, that’s where to start looking. Alisa Bruce liked this article on facebook.com. Laura Tortorelli liked this article on facebook.com. Rachel Laudan liked this article on facebook.com. Gabriel Davies liked this article on facebook.com. Layla Daoud liked this article on facebook.com. Paul Neate liked this article on facebook.com. Jennifer Wilkin Penick liked this article on facebook.com. Lyn Hunt liked this article on facebook.com. Fran Hortop liked this article on facebook.com. Phyllis Lee liked this article on facebook.com. Debora Tomeucci liked this article on facebook.com. Sadie Jane Ryan Simonovich liked this article on facebook.com. Luigi Guarino liked this article on facebook.com. Ken Albala liked this article on facebook.com. Mariana Kavroulaki liked this article on facebook.com. ChrisAldrich liked this article on twitter.com. Sara Tripodi liked this article on facebook.com. How an empty kitchen in Boston triggered a breakfast obsession and a new book on noodle soup.